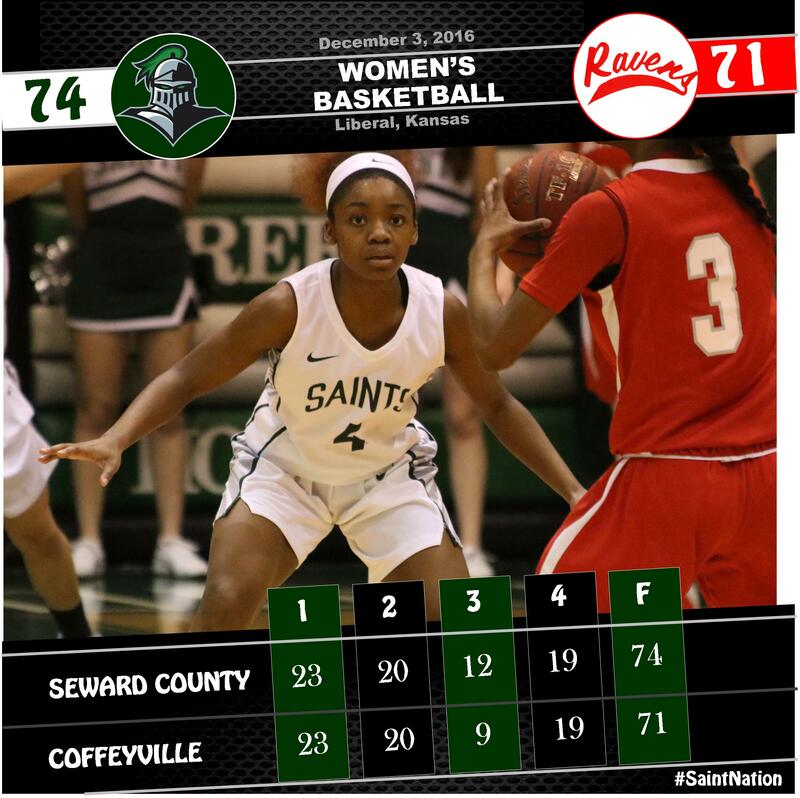 The cardiac kids that have become the Seward County Lady Saints were at it again Saturday night in the Greenhouse, as they battled Coffeyville tooth and nail for 40 minutes before hanging on in the final seconds for a 74-71 victory to stay unbeaten on the season at 9-0. Coffeyville looked far from the 13th best offense in the Jayhawk Conference early on Saturday night as they rained in a barrage of early bucket to take an 8-7 lead on Seward to get things going. The Lady Saints got their work done in a different manner, pounding the ball into the post to Joanna Grymek and use slashing drives from Clitan de Sousa to tie the score up at 16 with 3:19 left in the first quarter. The two continued to go back and forth to close the quarter out and Vanessa Caro knocked down a three for the gals in green to knot the score up at 23 after one. It was more of the same as the second quarter began with Erin Richardson burying a triple and Mollie Mounsey connecting on a short jumper to put Seward back ahead and then Coffeyville answering with a three of their own and a bucket in the paint to tie the game back up at 32. Grymek had her way with the Ravens in the second quarter, scoring on back to back possessions in the paint, but Coffeyville continued to answer and eventually took a two point lead before Manuela Fungate picked up a pair of hustle points to again tie the score at the second quarter horn at 43-43. Seward shot 53% in the first half but couldn’t find any breathing room because Coffeyville shot 49% overall and 50% from the three point line. Grymek led Seward with 13 first half points and was a perfect 6 for 6 from the floor. 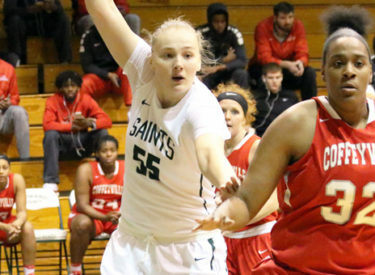 The heavyweight battle continued into the second half as Seward and Coffeyville traded body blows until both of them looked to have run out of some gas as they each went scoreless for a 2:40 stretch of the third quarter with the Lady Saints leading 49-48. A Raven bucket put Coffeyville on top by one, but Seward answered with a three from Neidy Ocuane to give the Lady Saints a 52-50 lead. After Coffeyville scored to even it up, Ocuane hit another triple, giving Seward a 55-52 lead with 2:04 remaining in the quarter and that was the way that the quarter finished with the Lady Saints on top by three. After a Coffeyville free throw made it a two point game early in the fourth, Grymek again established position and kissed one off the glass with 8:22 to go to give Seward a four point lead. The significance of the basket was much more than just two points though as it marked the first two possession lead for either team in the entire game, 31:38 in as the Lady Saints went up by four. Seward went up five moments later and looked like they might have just took the wind out of the Red Ravens sails as Mounsey drained a three to make it a 67-58 game with 3:27 left. Seward remained up seven with under a minute left, but it nearly looked like dejavu for the Lady Saints faithful as Coffeyville rained in a pair of threes on back to back trips, trimming the Seward lead to just one, much like Wednesday night against Cowley, with seven seconds remaining. Fortunately for the Lady Saints, the inbounds pass made it into the hands of Mounsey, their top free throw shooter, who cashed in on a pair of pressure charities to put Seward up three and their defense did the rest, allowing just a last second heave from half court that was off the mark to survive a spirited effort from the Red Ravens 74-71. Seward withstood a season best shooting effort from Coffeyville from deep as the Ravens hit 13 threes at a 50% clip Saturday night after failing to shoot better than 41% in any conference game this season from beyond the arc. The Lady Saints shot 46% from the field and dished out 22 assists on 29 made baskets while turning it over just nine times in the win. Grymek led the Lady Saints with 19 points on 9 of 11 shooting while Mounsey added 18 and 7 assists and Ocuane chipped in 14 and 7 helpers. Off the bench Seward benefitted from a team high 9 rebounds from Fungate who also pitched in with 6 points to lead the Lady Saints reserves. Seward stays unbeaten at 9-0 overall on the year and polishes their Jayhawk Conference mark up to 7-0 to remain in front of the rest of the league. Coffeyville falls to 5-5 overall and 4-3 in league play with the road loss. Things lighten up a bit for Seward in their final week of competition before the holiday break as they travel to Iola to take on Allen Wednesday and return home to play Neosho County Saturday night in the Greenhouse, two teams who have combined to lose six straight conference games after tonight’s action.